Add a critical light source or laser to firearms with the TacStar Universal Barrel Mounts from Lyman. This two-piece system delivers effortless, rapid and secure attachment of illumination accessories. Compatible with a T6 tactical flashlight or other 3/4-inch light, the universal mount ensures a dependable edge at night or in dark surroundings. 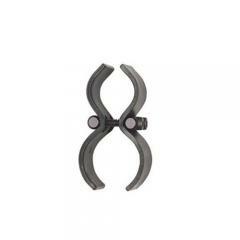 Simply clamp the precision-machined mounts on the barrel of a .22 cal to 12-gauge firearm. Weighing just 2-ounces, the mounts won't weigh down weapons, making them ideal for an extended mission. Lyman's products are proudly made in the USA.